The maggot is available in all respected tackle shops. They are the most popular coarse fishing bait in the UK, most probably because they are a trusted natural bait and for the amount you get, are very cheap to buy. However the main reason for there popularity amongst anglers is that the maggot (if the fish are feeding) is guaranteed to catch all known coarse fish, including the occasional pike! As well as some sea fish such as mullet and game fishing, mainly trout. If stored in a fridge, they will keep for a number of days before they turn into a caster, the caster can equally be a very good bait. 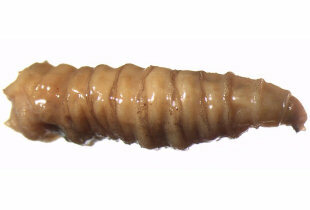 Maggots come in a variety sizes, the smaller ones are know as pinkies. Dyed maggots are also very popular, and colours include red, bronze and yellow. Maggots are bought by the pint (or ½ pint) so it’s well worth buying a variety of colours, although it worth separating these into different bait boxes, as its normally best to throw one colour in as loose feed, and use the other colour on the hook. Each day is different, but keeping the maggots in separate bait boxes keep your options open. The best way to hook a maggot is by gently pressing the body and its ‘beard’ will stick out, hook this part using a sharp small hook. If the maggot bursts discard it and use a fresh maggot. You may also hook the maggot through its tail end, hook it at the very end, again so it doesn’t burst. A popular method is called top & tail where you use two maggots on the same hook, using the two hooking methods described. 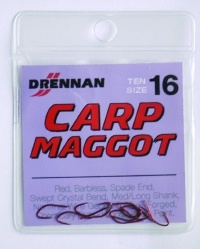 Drennan provide carp and silverfish maggot hooks. Spade end hooks are recommended, as the spade is less visible than an eyed hook. For carp fishing, you can hook as many as you can on one hook, although the best method it to literally thread about 50 maggots onto fine line using a pin, so you basically have a line full of maggots. Then tie this onto a hair-rig, the maggots will pull tight and form a ball shape. This is irresistible to carp. Other techniques include super glue, and feeder fishing them. The key to maggot fishing is to keep the bait fresh, and wriggling maggot is better than a static one. So change your bait when the maggot is looking dull. A good trick is to breathe on the maggot before it goes into the cold water. Warming up the maggot just before it hits the water will send it into a wriggling frenzy! The maggot is the larvae of the bluebottle, you could make you own maggot hatchery at home by using a dead chicken or sheeps heart to attract the flies, but these day its really much easier to purchase from your local shop, or go to your nearest maggot farm and buy by the bucket full! If you ever run out of maggots, there are also maggot vending machines availalbe!! What ever next?